It's now official. The one and only Cher herself revealed that she will kick off her "Dressed To Kill" 49 city North American Tour beginning in Phoenix on March 22nd with stops in NY, LA, Boston, Las Vegas, and other major markets. Cher shared the happy news with her fans following her performance on the Today Show this morning. Cher's lone Bay Area appearance will be Wednesday, July 2 at SAP Center at San Jose. Tickets go on-sale on Friday, October 4 at noon. Tickets are available at the SAP Center ticket office, online at ticketmaster.com or charge by phone at (800) 745-3000. A full list of "Dressed to Kill" tour dates and cities follows this release. The national tour promoter is Marshall Arts USA. 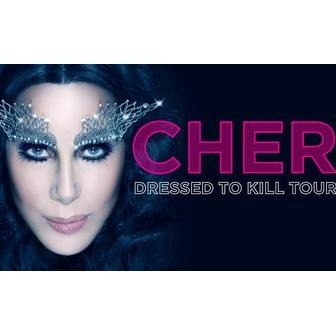 For ticket information and to sign up for tour updates please go to Cher.com . Cher's previous tour "The Farewell Tour" later dubbed "The Never Can Say Goodbye Tour" was one of the most successful tours ever by a solo artist and played for a record-breaking 325 dates and seen by over 5.5 million people. American Express® Cardmembers can purchase their tickets to select cities before the general public beginning Monday September 30th, 10am through Thursday, October 3rd, 10pm. For all online tickets purchased (presale and general public), ticketholders will receive a free copy of Cher's new album "Closer To The Truth", out September 24th on Warner Bros Records. Cher is in New York this week celebrating the album's release with upcoming appearances on David Letterman (Sept. 24th) and Live! with Kelly & Michael (October 1st). Cher will also be appearing as a mentor with Blake Shelton on NBC's The Voice airing in October.